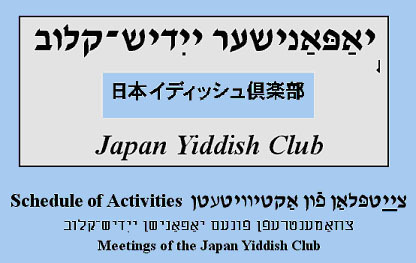 The Jews of Tokyo run an egalitarian congregation. Men and women sit together, women are counted in the minyan, receive aliyot and any other honor, can lead services and read Torah. The services of the congregation follow the traditional Ashkenazic nusach but use some English and a little Japanese here and there. Japan had hardly any traditional antisemitism before the Nazi ideology and propaganda during WWII influenced a small number of Japanese. 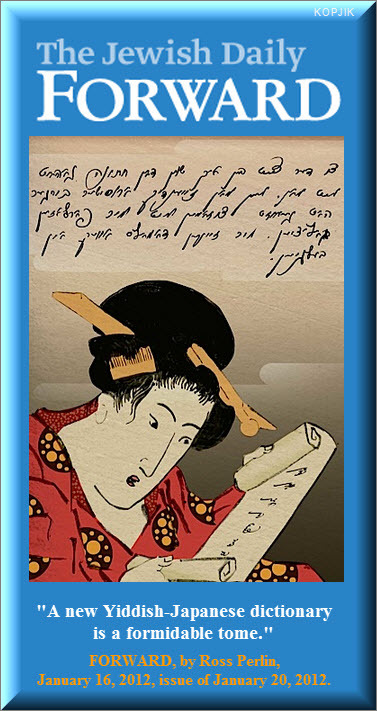 Antisemitism did not become a widespread phenomenon in Japan, but it persists even today, in the form of subculture. Antisemitic and conspiracist books and pamphlets are sold in major bookstores, and anti-semitic themes penetrates the popular culture and even affect the educated academic community. Many Japanese like plot theories (plots by government, by Jews, by ghosts, devils etc.). Iko Miko played in Japan. The club was established in the beginning of 1990 by two founders. 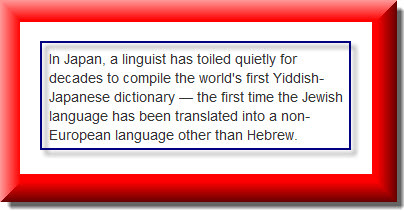 The first founder is Jack Halpern, who knows 12 languages and is a kanji researcher and lexicographer. The second founder is Chaim Pevner, an American linguist (he no longer lives in Japan). 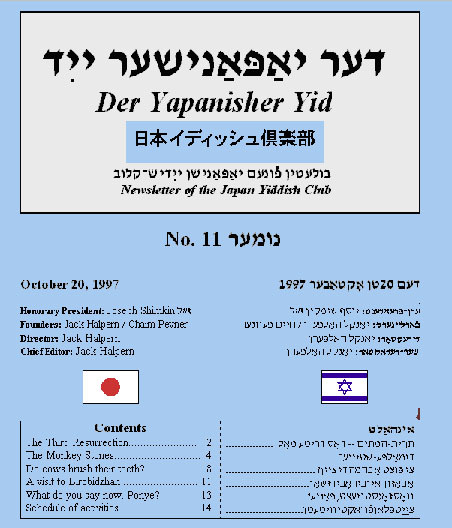 The honorary president of the Club was the late Joseph Shimkin, a speaker of a genuine Polish Yiddish who lived in Japan for many years. Members meet about twice a month on Sunday afternoons in the Judaica Library of the JCC. 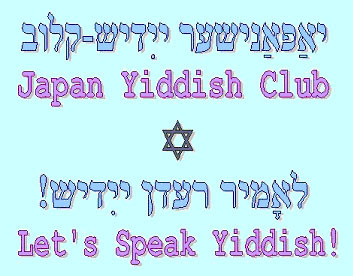 The Yiddish Club in Japan keep a small library of Yiddish books, magazines, cassettes and video tapes and publish the only Yiddish magazine in Japan and the far East. Japan’s leading scholar of Yiddish, Kazou Ueda with his wife. 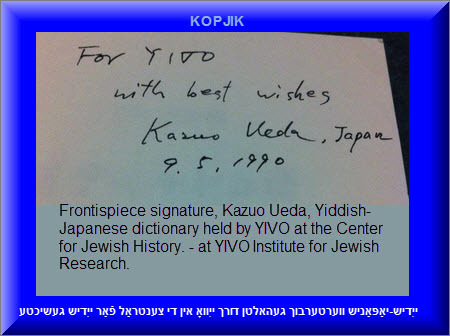 The registration of Ueda’s book at YIVO in New York. 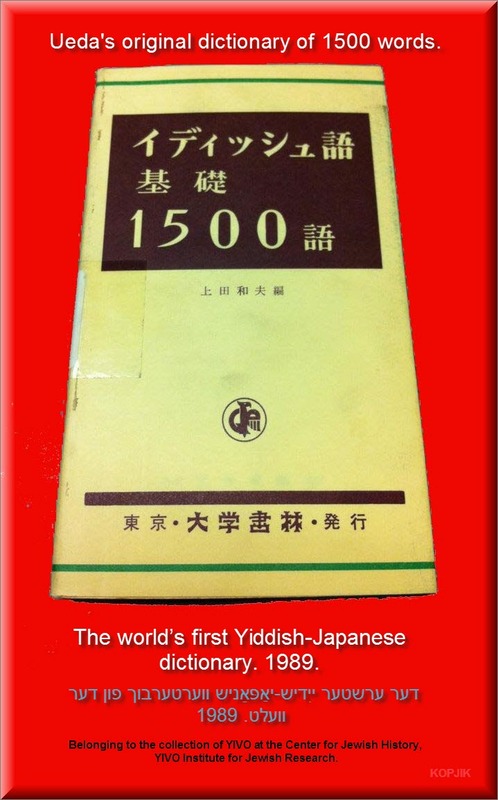 Ueda’s original dictionary of 1500 words published in 1989. FORWARD called it “a formidable tome”.